A canoe is a relatively small boat that is propelled by oars. In canoeing, rowers sit facing the direction in which they are moving (unlike in Rowing, where rowers are sitting facing the opposite direction). There is a type of raft canoeing in which the vessels used are similar to the ones used in rafting. 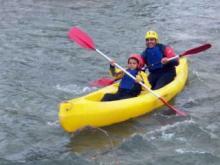 You may also follow the rivers Júcar and Cabriel in a canoe.